Top Spec sells low-slope and commercial roofing system products wherever MIDWEST ROOFING SUPPLY does business. Top Spec by WeatherBond’s EPDM Fully Adhered Roofing System provides building owners with a long-lasting, dependable roof system and applicators with fast and easy installation. 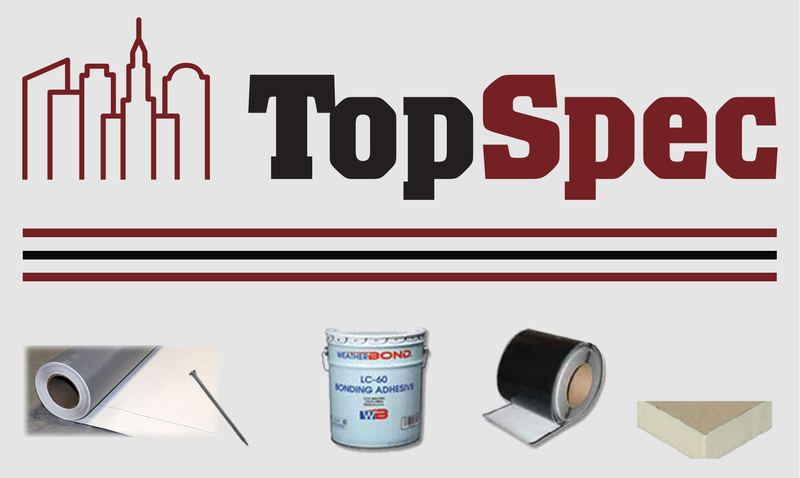 Top Spec by WeatherBond TPO is a complete heat-weldable single-ply roofing product line that can be either mechanically attached or fully adhered and provides extreme flexibility and long-term durability. The Weld-Free TPO System from Top Spec by WeatherBond is an energy-efficient, cool-roof option that can be fully adhered or mechanically attached without the use of a heat welder. Top Spec by WeatherBond PVC (polyvinyl chloride) membrane can be mechanically attached or fully adhered and features many cool-roof attributes, which reduces a building’s energy costs. Want a quote? Go to our Request a Quote form. Comments or questions? Contact Top Spec directly. Our WeatherBond brand offers customers peace of mind with our industry-leading Limited Lifetime warranty. Simply complete the WeatherBond warranty form, submit with a copy of the bill of sale or invoice, and rest assured that WeatherBond will have you covered. If you would like WeatherBond to mail you a warranty form, please fill out a literature request form and submit it to WeatherBond. Or send your name and address to support@weatherbondroofing.com.